Zing Script Rust is a typeface created by Jacklina Jekova together with Svet Simov and published by Fontfabric which is available in 37 styles, 29 script font (Base Thin, Base Light, Base Light Grunge, Base Light Halftone A, Base Line Diagonals, Fill, Semi Bold, Bold, Bold Grunge etc.) and 4 Zing Goodies (Bakery, BBQ, Banners & Words) each with two styles (Regular & Grunge). Also it has a wide range of OpenType features ideal to add a bit of energi to ypur projects. It works great on bfranding, display, editorial use, logo, packaging, poster, printetc. Have fun! Styles: Base Thin, Base Light, Base Light Grunge, Base Light Halftone A, Base Line Diagonals, Light Fill Grunge, Light Fill Halftone A, Light Fill Line Giagonals, Regular Base, Regular Base Grunge, Regular Base Halftone A, Regular Base Line Diagonals, Fill Grunge, Fill Halftone A, Fill Line Diagonals, Semibold Base, Semibold Grunge, Semibold Halftone A, Semibold Line Diagonals, Bold Brunge, Zing Bakery, BBQ, Banners, Words etc. 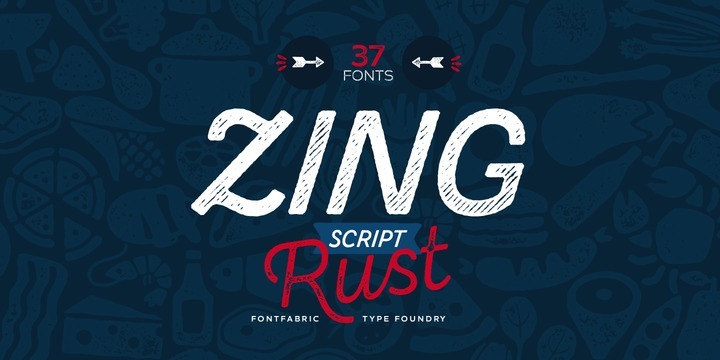 Note: “Zing Script Rust” is a trademark of Fontfabric. A font description published on Wednesday, January 3rd, 2018 in Fontfabric, Fonts, Jacklina Jekova, Svet Simov by Alexandra that has 1,542 views.